The word “benzene” derives from “gum benzoin” (benzoin resin), an aromatic resin known to European pharmacists and perfumers since the 15th century as a product of southeast Asia. An acidic material was derived from benzoin by sublimation, and named “flowers of benzoin”, or benzoic acid. The hydrocarbon derived from benzoic acid thus acquired the name benzin, benzol, or benzene. Michael Faraday first isolated and identified benzene in 1825 from the oily residue derived from the production of illuminating gas, giving it the name bicarburet of hydrogen. In 1833, Eilhard Mitscherlich produced it by distilling benzoic acid (from gum benzoin) and lime. He gave the compound the name benzin. In 1836, the French chemist Auguste Laurent named the substance “phène”; this word has become the root of the English word “phenol“, which is hydroxylated benzene, and “phenyl“, the radical formed by abstraction of a hydrogen atom (free radical H•) from benzene. In 1845, Charles Mansfield, working under August Wilhelm von Hofmann, isolated benzene from coal tar. Four years later, Mansfield began the first industrial-scale production of benzene, based on the coal-tar method. Gradually, the sense developed among chemists that a number of substances were chemically related to benzene, comprising a diverse chemical family. In 1855, Hofmann used the word “aromatic” to designate this family relationship, after a characteristic property of many of its members. In 1997, benzene was detected in deep space. Historic benzene structures (from left to right) by Claus (1867), Dewar (1867), Ladenburg (1869), Armstrong (1887), Thiele (1899) and Kekulé (1865). Dewar benzene and prismane are different chemicals that have Dewar’s and Ladenburg’s structures. Thiele and Kekulé’s structures are used today. In 1865, the German chemist Friedrich August Kekulé published a paper in French (for he was then teaching in Francophone Belgium) suggesting that the structure contained a ring of six carbon atoms with alternating single and double bonds. The next year he published a much longer paper in German on the same subject. Kekulé used evidence that had accumulated in the intervening years—namely, that there always appeared to be only one isomer of any monoderivative of benzene, and that there always appeared to be exactly three isomers of every disubstituted derivative—now understood to correspond to the ortho, meta, and para patterns of arene substitution—to argue in support of his proposed structure. Kekulé’s symmetrical ring could explain these curious facts, as well as benzene’s 1:1 carbon-hydrogen ratio. The new understanding of benzene, and hence of all aromatic compounds, proved to be so important for both pure and applied chemistry that in 1890 the German Chemical Society organized an elaborate appreciation in Kekulé’s honor, celebrating the twenty-fifth anniversary of his first benzene paper. Here Kekulé spoke of the creation of the theory. He said that he had discovered the ring shape of the benzene molecule after having a reverie or day-dream of a snake seizing its own tail (this is a common symbol in many ancient cultures known as the Ouroboros or Endless knot). This vision, he said, came to him after years of studying the nature of carbon-carbon bonds. This was 7 years after he had solved the problem of how carbon atoms could bond to up to four other atoms at the same time. Curiously, a similar, humorous depiction of benzene had appeared in 1886 in a pamphlet entitled Berichte der Durstigen Chemischen Gesellschaft (Journal of the Thirsty Chemical Society), a parody of the Berichte der Deutschen Chemischen Gesellschaft, only the parody had monkeys seizing each other in a circle, rather than snakes as in Kekulé’s anecdote. Some historians have suggested that the parody was a lampoon of the snake anecdote, possibly already well known through oral transmission even if it had not yet appeared in print. Kekulé’s 1890 speech in which this anecdote appeared has been translated into English. If the anecdote is the memory of a real event, circumstances mentioned in the story suggest that it must have happened early in 1862. The German chemist Wilhelm Körner suggested the prefixes ortho-, meta-, para- to distinguish di-substituted benzene derivatives in 1867; however, he did not use the prefixes to distinguish the relative positions of the substituents on a benzene ring. It was the German chemist Karl Gräbe who, in 1869, first used the prefixes ortho-, meta-, para- to denote specific relative locations of the substituents on a di-substituted aromatic ring (viz, naphthalene). In 1870, the German chemist Viktor Meyer first applied Gräbe’s nomenclature to benzene. Trace amounts of benzene are found in petroleum and coal. It is a byproduct of the incomplete combustion of many materials. For commercial use, until World War II, most benzene was obtained as a by-product of coke production (or “coke-oven light oil”) for the steel industry. However, in the 1950s, increased demand for benzene, especially from the growing polymers industry, necessitated the production of benzene from petroleum. Today, most benzene comes from the petrochemical industry, with only a small fraction being produced from coal. Many important chemical compounds are derived from benzene by replacing one or more of its hydrogen atoms with another functional group. Examples of simple benzene derivatives are phenol, toluene, and aniline, abbreviated PhOH, PhMe, and PhNH2, respectively. Linking benzene rings gives biphenyl, C6H5–C6H5. Further loss of hydrogen gives “fused” aromatic hydrocarbons, such as naphthalene, anthracene, phenanthrene, and pyrene. The limit of the fusion process is the hydrogen-free allotrope of carbon, graphite. This is often called “on-purpose” methodology to produce benzene, compared to conventional BTX (benzene-toluene-xylene) extraction processes. Benzene is used mainly as an intermediate to make other chemicals, above all ethylbenzene, cumene, cyclohexane, nitrobenzene, and alkylbenzene. More than half of the entire benzene production is processed into ethylbenzene, a precursor to styrene, which is used to make polymers and plastics like polystyrene and EPS. Some 20% of the benzene production is used to manufacture cumene, which is needed to produce phenol and acetone for resins and adhesives. Cyclohexane consumes around 10% of the world’s benzene production; it is primarily used in the manufacture of nylon fibers, which are processed into textiles and engineering plastics. Smaller amounts of benzene are used to make some types of rubbers, lubricants, dyes, detergents, drugs, explosives, and pesticides. In 2013, the biggest consumer country of benzene was China, followed by the USA. Benzene production is currently expanding in the Middle East and in Africa, whereas production capacities in Western Europe and North America are stagnating. As a gasoline (petrol) additive, benzene increases the octane rating and reduces knocking. As a consequence, gasoline often contained several percent benzene before the 1950s, when tetraethyl lead replaced it as the most widely used antiknock additive. With the global phaseout of leaded gasoline, benzene has made a comeback as a gasoline additive in some nations. In the United States, concern over its negative health effects and the possibility of benzene’s entering the groundwater have led to stringent regulation of gasoline’s benzene content, with limits typically around 1%. European petrol specifications now contain the same 1% limit on benzene content. The United States Environmental Protection Agency introduced new regulations in 2011 that lowered the benzene content in gasoline to 0.62%. In many European languages, the word for petroleum or gasoline is an exact cognate of “benzene”. Highly instructive but of far less industrial significance is the Friedel-Crafts alkylation of benzene (and many other aromatic rings) using an alkyl halide in the presence of a strong Lewis acid catalyst. Similarly, the Friedel-Crafts acylation is a related example of electrophilic aromatic substitution. The reaction involves the acylation of benzene (or many other aromatic rings) with an acyl chloride using a strong Lewis acid catalyst such as aluminium chloride or Iron(III) chloride. The American Petroleum Institute (API) stated in 1948 that “it is generally considered that the only absolutely safe concentration for benzene is zero”. There is no safe exposure level; even tiny amounts can cause harm. The US Department of Health and Human Services (DHHS) classifies benzene as a human carcinogen. Long-term exposure to excessive levels of benzene in the air causes leukemia, a potentially fatal cancer of the blood-forming organs. 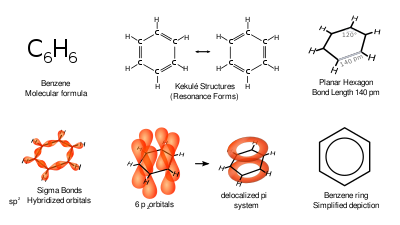 In particular, acute myeloid leukemia or acute nonlymphocytic leukemia (AML & ANLL) is not disputed to be caused by benzene. IARC rated benzene as “known to be carcinogenic to humans” (Group 1). The U.S. Occupational Safety and Health Administration (OSHA) has set a permissible exposure limit of 1 part of benzene per million parts of air (1 ppm) in the workplace during an 8-hour workday, 40-hour workweek. The short term exposure limit for airborne benzene is 5 ppm for 15 minutes. These legal limits were based on studies demonstrating compelling evidence of health risk to workers exposed to benzene. The risk from exposure to 1 ppm for a working lifetime has been estimated as 5 excess leukemia deaths per 1,000 employees exposed. (This estimate assumes no threshold for benzene’s carcinogenic effects.) OSHA has also established an action level of 0.5 ppm to encourage even lower exposures in the workplace. ^ “Front Matter”. Nomenclature of Organic Chemistry: IUPAC Recommendations and Preferred Names 2013 (Blue Book). Cambridge: The Royal Society of Chemistry. 2014. pp. P001–P004. doi:10.1039/9781849733069-FP001. ISBN 978-0-85404-182-4. ^ Arnold, D.; Plank, C.; Erickson, E.; Pike, F. (1958). “Solubility of Benzene in Water”. Industrial & Engineering Chemistry Chemical & Engineering Data Series. 3 (2): 253–256. doi:10.1021/i460004a016. ^ Breslow, R.; Guo, T. (1990). “Surface tension measurements show that chaotropic salting-in denaturants are not just water-structure breakers”. Proceedings of the National Academy of Sciences of the United States of America. 87 (1): 167–9. Bibcode:1990PNAS…87..167B. doi:10.1073/pnas.87.1.167. PMC 53221. PMID 2153285. ^ Coker, A. Kayode; Ludwig, Ernest E. (2007). Ludwig’s Applied Process Design for Chemical And Petrochemical Plants. 1. Elsevier. p. 114. ISBN 978-0-7506-7766-0. Retrieved 2012-05-31. ^ a b c d e “Benzol”. ^ a b c NIOSH Pocket Guide to Chemical Hazards. “#0049”. National Institute for Occupational Safety and Health (NIOSH). ^ “Benzene”. Immediately Dangerous to Life and Health Concentrations (IDLH). National Institute for Occupational Safety and Health (NIOSH). ^ The word “benzoin” is derived from the Arabic expression “luban jawi“, or “frankincense of Java“. Morris, Edwin T. (1984). Fragrance: The Story of Perfume from Cleopatra to Chanel. Charles Scribner’s Sons. p. 101. ISBN 978-0684181950. ^ a b Rocke, A. J. (1985). “Hypothesis and Experiment in the Early Development of Kekule’s Benzene Theory”. Annals of Science. 42 (4): 355–81. doi:10.1080/00033798500200411. ^ Faraday, M. (1825). “On new compounds of carbon and hydrogen, and on certain other products obtained during the decomposition of oil by heat”. Philosophical Transactions of the Royal Society. 115: 440–466. doi:10.1098/rstl.1825.0022. JSTOR 107752. On pages 443–450, Faraday discusses “bicarburet of hydrogen” (benzene). On pages 449–450, he shows that benzene’s empirical formula is C6H6, although he doesn’t realize it because he (like most chemists at that time) used the wrong atomic mass for carbon (6 instead of 12). ^ Kaiser, R. (1968). “Bicarburet of Hydrogen. Reappraisal of the Discovery of Benzene in 1825 with the Analytical Methods of 1968”. Angewandte Chemie International Edition in English. 7 (5): 345–350. doi:10.1002/anie.196803451. ^ Critics pointed out a problem with Kekulé’s original (1865) structure for benzene: Whenever benzene underwent substitution at the ortho position, two distinguishable isomers should have resulted, depending on whether a double bond or a single bond existed between the carbon atoms to which the substituents were attached; however, no such isomers were observed. In 1872, Kekulé suggested that benzene had two complementary structures and that these forms rapidly interconverted, so that if there were a double bond between any pair of carbon atoms at one instant, that double bond would become a single bond at the next instant (and vice versa). To provide a mechanism for the conversion process, Kekulé proposed that the valency of an atom is determined by the frequency with which it collided with its neighbors in a molecule. As the carbon atoms in the benzene ring collided with each other, each carbon atom would collide twice with one neighbor during a given interval and then twice with its other neighbor during the next interval. Thus, a double bond would exist with one neighbor during the first interval and the other neighbor during the next interval. See pages 86–89 of Auguste Kekulé (1872) “Ueber einige Condensationsprodukte des Aldehyds” (On some condensation products of aldehydes), Liebig’s Annalen der Chemie und Pharmacie, 162(1): 77–124, 309–320. ^ Hofmann, A. W. (1845) “Ueber eine sichere Reaction auf Benzol” (On a reliable test for benzene), Annalen der Chemie und Pharmacie, vol. 55, pp. 200–205; on pp. 204–205, Hofmann found benzene in coal tar oil. ^ Mansfield Charles Blachford (1849). “Untersuchung des Steinkohlentheers”. Annalen der Chemie und Pharmacie. 69 (2): 162–180. doi:10.1002/jlac.18490690203. ^ Claus, Adolph K.L. (1867) “Theoretische Betrachtungen und deren Anwendungen zur Systematik der organischen Chemie” (Theoretical considerations and their applications to the classification scheme of organic chemistry), Berichte über die Verhandlungen der Naturforschenden Gesellschaft zu Freiburg im Breisgau (Reports of the Proceedings of the Scientific Society of Freiburg in Breisgau), 4 : 116-381. In the section Aromatischen Verbindungen (aromatic compounds), pp. 315-347, Claus presents Kekulé’s hypothetical structure for benzene (p. 317), presents objections to it, presents an alternative geometry (p. 320), and concludes that his alternative is correct (p.326). See also figures on p. 354 or p. 379. ^ Dewar, James (1867) “On the oxidation of phenyl alcohol, and a mechanical arrangement adapted to illustrate structure in the non-saturated hydrocarbons,” Proceedings of the Royal Society of Edinburgh 6: 82–86. ^ Ladenburg, Albert (1869) “Bemerkungen zur aromatischen Theorie” (Observations on the aromatic theory), Berichte der Deutschen Chemischen Gesellschaft 2: 140–142. ^ Armstrong, Henry E. (1887) “An explanation of the laws which govern substitution in the case of benzenoid compounds,” Journal of the Chemical Society, 51, 258–268; see p. 264. ^ Thiele, Johannes (1899) “Zur Kenntnis der ungesättigten Verbindungen” (On our knowledge of unsaturated compounds), Justus Liebig’s Annalen der Chemie,306: 87–142; see: “VIII. Die aromatischen Verbindungen. Das Benzol.” (VIII. The aromatic compounds. Benzene. ), pp. 125–129. See further: Thiele (1901) “Zur Kenntnis der ungesättigen Verbindungen,” Justus Liebig’s Annalen der Chemie, 319: 129–143. Armstrong, H.E. (1890). “The structure of cycloid hydrocarbons”. Proceedings of the Chemical Society. 6: 101–105. Armit, James Wilson; Robinson, Robert (1925). “Polynuclear heterocyclic aromatic types. Part II. Some anhydronium bases”. Journal of the Chemical Society, Transactions. 127: 1604–1618. doi:10.1039/ct9252701604. Balaban, Alexandru T.; Schleyer, Paul v. R.; Rzepa, Henry S. (2005). “Crocker, Not Armit and Robinson, Begat the Six Aromatic Electrons”. Chemical Reviews. 105 (10): 3436–3447. doi:10.1021/cr0300946. PMID 16218557. ^ Kekulé, F. A. (1865). “Sur la constitution des substances aromatiques”. Bulletin de la Societe Chimique de Paris. 3: 98–110. On p. 100, Kekulé suggests that the carbon atoms of benzene could form a “chaîne fermée” (a closed chain, a loop). ^ Kekulé, F. A. (1866). “Untersuchungen über aromatische Verbindungen (Investigations of aromatic compounds)”. Liebigs Annalen der Chemie und Pharmacie. 137 (2): 129–36. doi:10.1002/jlac.18661370202. ^ English translation Wilcox, David H.; Greenbaum, Frederick R. (1965). “Kekule’s benzene ring theory: A subject for lighthearted banter”. Journal of Chemical Education. 42 (5): 266–67. Bibcode:1965JChEd..42..266W. doi:10.1021/ed042p266. ^ Kekulé, F. A. (1890). “Benzolfest: Rede”. Berichte der Deutschen Chemischen Gesellschaft. 23: 1302–11. doi:10.1002/cber.189002301204. ^ Benfey O. T. (1958). “August Kekulé and the Birth of the Structural Theory of Organic Chemistry in 1858”. Journal of Chemical Education. 35 (1): 21–23. Bibcode:1958JChEd..35…21B. doi:10.1021/ed035p21. ^ Gillis Jean (1966). “Auguste Kekulé et son oeuvre, réalisée à Gand de 1858 à 1867”. Mémoires de la Classe des Sciences – Académie Royale des Sciences, des Lettres et des Beaux-arts de Belgique. 37 (1): 1–40. ^ Lonsdale, K. (1929). “The Structure of the Benzene Ring in Hexamethylbenzene”. Proceedings of the Royal Society. 123A (792): 494. doi:10.1098/rspa.1929.0081. ^ Lonsdale, K. (1931). “An X-Ray Analysis of the Structure of Hexachlorobenzene, Using the Fourier Method”. Proceedings of the Royal Society. 133A (822): 536–553. Bibcode:1931RSPSA.133..536L. doi:10.1098/rspa.1931.0166. ^ Graebe (1869) “Ueber die Constitution des Naphthalins” (On the structure of naphthalene), Annalen der Chemie und Pharmacie, 149 : 20–28; see especially p. 26. ^ Victor Meyer (1870) “Untersuchungen über die Constitution der zweifach-substituirten Benzole” (Investigations into the structure of di-substituted benzenes), Annalen der Chemie und Pharmacie, 156 : 265–301; see especially pp. 299–300. ^ a b Hillis O. Folkins (2005). “Benzene”. Ullmann’s Encyclopedia of Industrial Chemistry. Ullmann’s Encyclopedia of Industrial Chemistry. Weinheim: Wiley-VCH. doi:10.1002/14356007.a03_475. ISBN 978-3527306732. ^ Moran D, Simmonett AC, Leach FE, Allen WD, Schleyer PV, Schaefer HF (2006). “Popular Theoretical Methods Predict Benzene and Arenes To Be Nonplanar”. Journal of the American Chemical Society. 128 (29): 9342–3. doi:10.1021/ja0630285. PMID 16848464. ^ Cooper, David L.; Gerratt, Joseph; Raimondi, Mario (1986). “The electronic structure of the benzene molecule”. Nature. 323 (6090): 699–701. Bibcode:1986Natur.323..699C. doi:10.1038/323699a0. ^ Pauling, Linus (1987). “Electronic structure of the benzene molecule”. Nature. 325 (6103): 396. Bibcode:1987Natur.325..396P. doi:10.1038/325396d0. ^ Messmer, Richard P.; Schultz, Peter A. (1987). “The electronic structure of the benzene molecule”. Nature. 329 (6139): 492. Bibcode:1987Natur.329..492M. doi:10.1038/329492a0. ^ Harcourt, Richard D. (1987). “The electronic structure of the benzene molecule”. Nature. 329 (6139): 491–492. Bibcode:1987Natur.329..491H. doi:10.1038/329491b0. ^ “Unicode Character ‘BENZENE RING’ (U+232C)”. fileformat.info. Retrieved 2009-01-16. ^ “Unicode Character ‘BENZENE RING WITH CIRCLE’ (U+23E3)”. fileformat.info. Retrieved 2009-01-16. ^ “Heterocyclic Chemistry: Heterocyclic Compounds”. Michigan State University, Department of Chemistry. ^ “Market Study: Benzene (2nd edition), Ceresana, August 2014”. ceresana.com. Retrieved 2015-02-10. ^ “Market Study: Toluene, Ceresana, January 2015”. ceresana.com. Retrieved 2015-02-10. ^ “Control of Hazardous Air Pollutants From Mobile Sources”. U.S. Environmental Protection Agency. 2006-03-29. p. 15853. Archived from the original on 2008-12-05. Retrieved 2008-06-27. Stranks, D. R.; M. L. Heffernan; K. C. Lee Dow; P. T. McTigue; G. R. A. Withers (1970). Chemistry: A structural view. Carlton, Victoria: Melbourne University Press. p. 347. ISBN 978-0-522-83988-3. ^ Kasper, Dennis L.et al. (2004) Harrison’s Principles of Internal Medicine, 16th ed., McGraw-Hill Professional, p. 618, ISBN 0071402357. ^ Merck Manual, Home Edition, “Overview of Leukemia”. ^ Bard, D (2014). “Traffic-related air pollution and the onset of myocardial infarction: disclosing benzene as a trigger? A small-area case-crossover study”. PLOS ONE. 9 (6): 6. Bibcode:2014PLoSO…9j0307B. doi:10.1371/journal.pone.0100307. PMC 4059738. PMID 24932584. ^ a b Smith, Martyn T. (2010). “Advances in understanding benzene health effects and susceptibility”. Annu Rev Public Health. 31: 133–48. doi:10.1146/annurev.publhealth.012809.103646. PMC 4360999. PMID 20070208. ^ Smith, Martyn T. (2010-01-01). “Advances in Understanding Benzene Health Effects and Susceptibility”. Annual Review of Public Health. 31 (1): 133–148. doi:10.1146/annurev.publhealth.012809.103646. PMC 4360999. PMID 20070208. ^ Huff J (2007). “Benzene-induced cancers: abridged history and occupational health impact”. Int J Occup Environ Health. 13 (2): 213–21. doi:10.1179/oeh.2007.13.2.213. PMC 3363002. PMID 17718179. ^ Rana SV; Verma Y (2005). “Biochemical toxicity of benzene”. J Environ Biol. 26 (2): 157–68. PMID 16161967. ^ Yardley-Jones, A.; Anderson, D.; Parke, D. V. (1991). “The toxicity of benzene and its metabolism and molecular pathology in human risk assessment”. British Journal of Industrial Medicine. 48 (7): 437–44. PMC 1035396. PMID 1854646. ^ “Public Health Statement for Benzene” U.S. Department of Health and Human Services, Public Health Service, Centers for Disease Control, National Institute for Occupational Safety and Health. Atsdr.cdc.gov (2011-03-03). Retrieved on 2011-11-23. ^ Ashley, DL; Bonin, MA; Cardinali, FL; McCraw, JM; Wooten, JV (1994). “Blood concentrations of volatile organic compounds in a nonoccupationally exposed US population and in groups with suspected exposure” (PDF). Clinical Chemistry. 40 (7 Pt 2): 1401–4. PMID 8013127. ^ Fustinoni S, Buratti M, Campo L, Colombi A, Consonni D, Pesatori AC, Bonzini M, Farmer P, Garte S, Valerio F, Merlo DF, Bertazzi PA (2005). “Urinary t,t-muconic acid, S-phenylmercapturic acid and benzene as biomarkers of low benzene exposure”. Chemico-Biological Interactions. 153–154: 253–6. doi:10.1016/j.cbi.2005.03.031. PMID 15935823. ^ Snyder, R; Hedli, C.C. (1996). 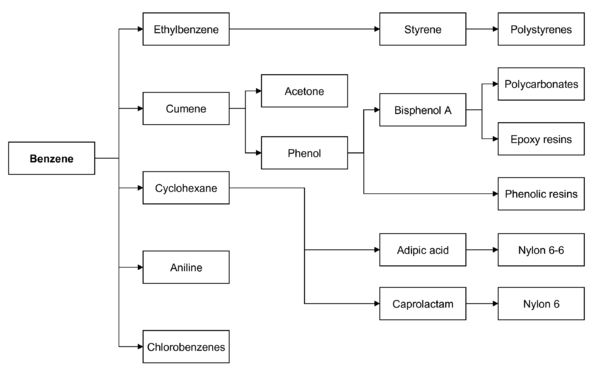 “An overview of benzene metabolism”. Environ Health Perspect. 104 (Suppl 6): 1165–1171. doi:10.1289/ehp.96104s61165. PMC 1469747. PMID 9118888. ^ Dougherty, D; Garte, S; Barchowsky, A; Zmuda, J; Taioli, E (2008). “NQO1, MPO, CYP2E1, GSTT1 and STM1 polymorphisms and biological effects of benzene exposure—a literature review”. Toxicology Letters. 182 (1–3): 7–17. doi:10.1016/j.toxlet.2008.09.008. PMID 18848868. ^ Fracasso ME, Doria D, Bartolucci GB, Carrieri M, Lovreglio P, Ballini A, Soleo L, Tranfo G, Manno M (2010). “Low air levels of benzene: Correlation between biomarkers of exposure and genotoxic effects”. Toxicol Lett. 192 (1): 22–8. doi:10.1016/j.toxlet.2009.04.028. PMID 19427373. ^ Eastmond, D.A. ; Rupa, DS; Hasegawa, LS (2000). “Detection of hyperdiploidy and chromosome breakage in interphase human lymphocytes following exposure to the benzene metabolite hydroquinone using multicolor fluorescence in situ hybridization with DNA probes”. Mutat Res. 322 (1): 9–20. doi:10.1016/0165-1218(94)90028-0. PMID 7517507. ^ Garte, S; Taioli, E; Popov, T; Bolognesi, C; Farmer, P; Merlo, F (2000). “Genetic susceptibility to benzene toxicity in humans”. J Toxicol Environ Health A. 71 (22): 1482–1489. doi:10.1080/15287390802349974. PMID 18836923. ^ “FDA: Too Much Benzene In Some Drinks”, CBS News, May 19, 2006. Retrieved July 11, 2006.